Katzenstein’s compensation hypothesis and the Scandinavian welfare states. According to the compensation hypothesis, the large welfare states of Scandinavian countries is a response to the economic volatility these countries suffer as a result of being exposed to international markets. The standard reference is Katzenstein (1985), though the idea can be traced back at least to Cameron (1978) and Lindbeck (1975). These days, another idea regarding compensation, welfare states and economic openess, is gaining ground. 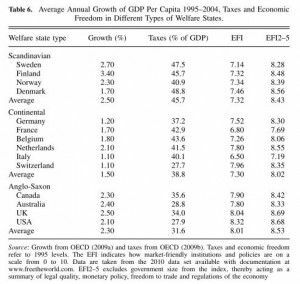 The idea is that welfare states are compensating for the problems caused by high taxes using economic openess and otherwise market friendly policies (references provided below). First, that countries with with larger public sectors tend to be more open. Second, that countries that are more open are more exposed to risk. While Katzenstein is often cited by political scientists, the first claim was made popular among economists by Rodrik (1998), who joined Katzenstein and Lindbeck in interpreting the correlation as a causality running from ‘‘exposure to external risk to government spending" (Rodrik, p. 988). Interestingly, the second claim remained untested for a long time. When it evetually was put to empirical test, it was found to be wrong. In 2001, Iversen’s (2001) noted that , in the post-war period, the more open OECD economies appear to have experienced lower output volatility than did more closed economies. Later, Down (2007) noted that according to economic theory, expansion of international trade that entails integration into larger markets should give rise to risk diversiﬁcation, and thus should promote rather than reduce economic stability. The openness-volatility link was questioned on similar theoretical grounds also by Kim (2007), who also noted that a statistical analysis of a panel data set from 175 countries (1950–2002) finds no significant effect of openness on volatility. In other words, the idea that exposure to international markets causes volatility for small countries, and that these countries develop welfare states to compensate for this volatility, was shown to be empirically wrong: more open economies are not necessarily more volatile externally or internally. Iversen is given empiricval support by Epifani and Gancia (2009), who show that countries with high taxes beneﬁt from globalisation via a terms of trade mechanism. Essentially, higher production costs are passed on to consumers globally because exporters in high tax countries have market power and can increase prices to levels well above marginal costs. The idea is perhaps most easily illustrated using the Economic Freedom Index, as shown by the table below (taken from Bergh and Henrekson 2011). The table shows that the Scandinavian countries do exhibit growth rates similar to (or even higher than) Anglo-Saxon countries, but they also have similar levels of economic freedom – once you control for their large public sectors. In conclusion: To explain why some countries have developed larger welfare states than others, we can no longer say that they are compensating for volatility induced by international markets. Rather, economic openess is an important way for high tax countries to keep their economies competitive. To explain variation is welfare state size, other factors are needed (such as variations in historical trust levels, as suggested by Bergh and Bjørnskov 2011). Bergh, A., and Henrekson, M. (2011). Government Size and Growth: A Survey and Interpretation of the Evidence. Journal of Economic Surveys, 25, 872–897. Cameron, David R. 1978. “The Expansion of the Public Economy: A Comparative Analysis." American Political Science Review 72:1243-61. Epifani, Paolo, and Gancia G Gino. 2009. “Openness, Government Size and the Terms of Trade." Review of Economics Studies 76 (2):629–68. Iversen, T. (2001). The new politics of the welfare state: Oxford University Press. Iversen, Torben. 2005. Capitalism, Democracy and Welfare. USA: Cambridge University Press. Katzenstein, Peter. 1985. Small States in World Markets: Industrial Policy in Europe. Ithaca, N.Y.: Cornell University Press. Kim, So Young. 2007. “Openness, External Risk, and Volatility: Implications for the Compensation Hypothesis." International Organization 61:181-181. Lindbeck, Assar. 1975. “Business Cycles, Politics, and International Economic Dependence." Skandinaviska Enskilden Bank Quarterly Review 2:53-68. Rodrik, D. (1998). Why do more open economies have bigger governments? The Journal of Political Economy, 106, 997-1032. Finally, here’s a recent blog-post by Dan Mitchell showing that the new version of the compensation hypothesis has reached the blogosphere.